Today, for Day 2 of my 5 Day Life Edit challenge, I decided to tackle something a bit more physical. For Day 1, I cleaned up and organized my USB Drive and the desktop of my computer. 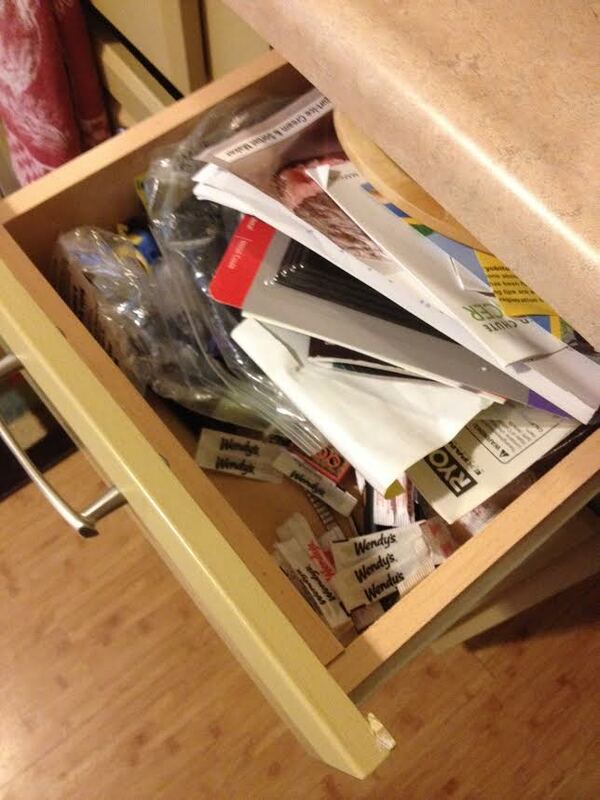 Today it’s the dreaded junk drawer in the kitchen! Everyone has one. That one small drawer in the kitchen that you never really utilized (though you should have!). And so it becomes the place for important recipes you wrote down, batteries (new and old), screws, nails, that screwdriver you forgot to put back in the tool box, small toys, junk mail, receipts you think you need to hang on to, bread ties, pencils, tealights, phone numbers, trivets, miscellaneous kitchen gadgets you wanted but never use, the important directions that come with everything you’ve ever bought, you get the idea! We’ve lived in this house for almost 8 years now and not once has our kitchen junk drawer ever been cleaned out. I’m not kidding! As you can see from the first picture, I could only open it halfway because it was so full of junk. The gadget pile: lots of things we thought we needed but have yet to ever use! I started by pulling everything out and organizing it into piles: important papers, gadgets, things that can go somewhere else or back to their proper place, and junk. It only took about ten minutes to empty the drawer and divide the contents into my different piles. I was not surprised at all by the junk pile and how easy it was to decide what to part with. I found receipts that were two and three years old. I have no idea why we were keeping them. Old coupons. Bread ties. 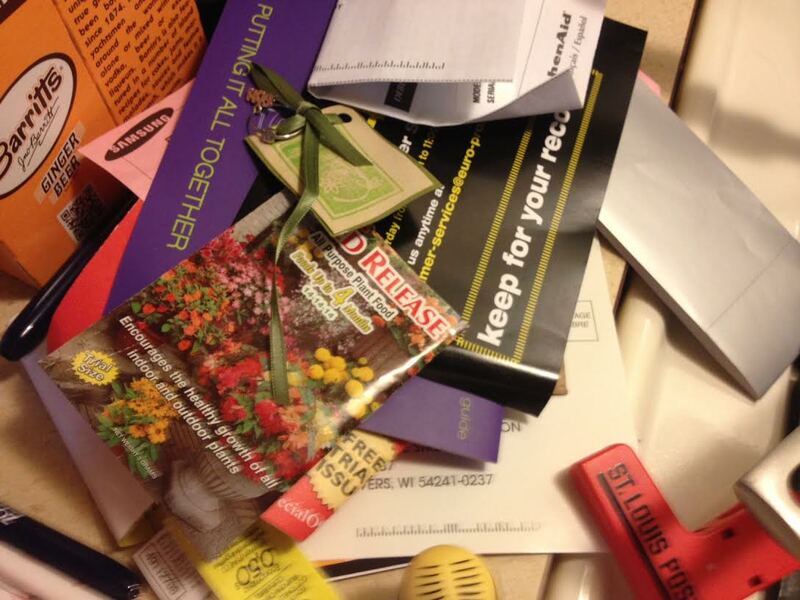 Those flower fertilizer packets that come with live flowers at Valentines Day. Old warranties for products we don’t even own anymore – Hmm…guess we should have looked for that warranty when it played out. Money mailers that we never opened. Fast food straws. Blank envelopes that come with bills – why we kept them I don’t know. We have recycling! So, this was my largest pile which I was happy to part with. What I had the most trouble with was all the paper I had left over. I didn’t want to spend time going through what needed to be kept or what didn’t, so I quickly narrowed it down to only the instruction booklets for gadgets or items we still had. I also kept some recipe booklets I’d found, and that was it. The rest got added to the junk pile very quickly. 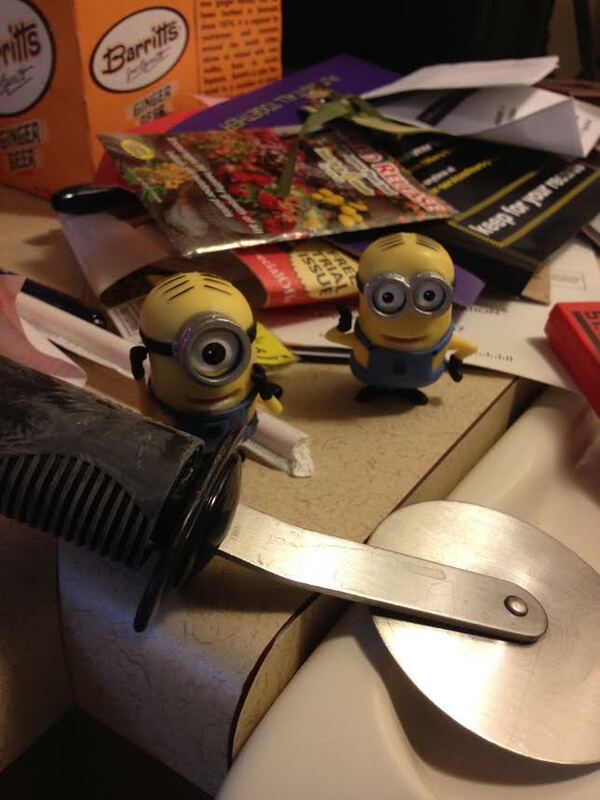 I found minions in my junk drawer! I also had a pile of batteries – new and old and no way to tell what was what. So, I threw them all in a Ziploc bag as a means to at least keep them together. Any stray tools and screwdrivers and tape measures went to the basement in the toolbox where they actually belong. I started another Ziploc bag for fast food salt and pepper packets which we do occasionally use. But any sauce packets got tossed! 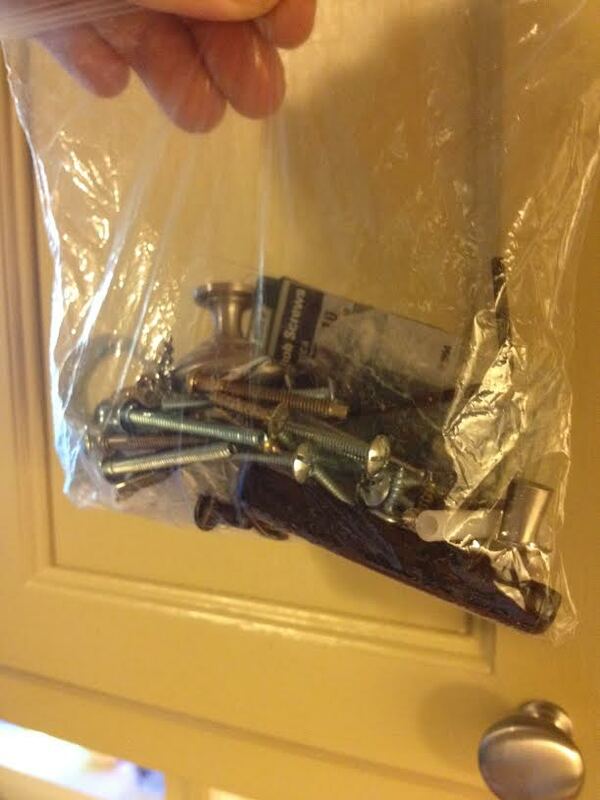 And another Ziploc bag quickly filled up with stray nails, screws, nuts, and bolts – which also went to the basement toolbox! It now took less time to reorganize the drawer by deciding what to put back in it. I put the stack of booklets and papers in the back. The trivets went up front since that is the one thing from the drawer we do use the most. A few odd and end items and the Ziploc bags went in between. Lastly, I grabbed that trash can, took the lid off, and happily swept a big pile of stuff in the trash! Now, you might be thinking….so what? Shannon cleaned out a junk drawer. Well, remember what I said earlier. This junk drawer hasn’t been cleaned out in almost 8 years!! Just like I said in my beginning Life Edit post – this is about addressing spaces in your life that you’ve constantly overlooked. This kitchen junk drawer has always been on my mind, time after time, year after year, but always got overlooked. So, that’s what life editing is about: Finally taking charge and getting that overlooked task done. I put the tools back where they belonged. I organized things the way they should have been done in the first place. 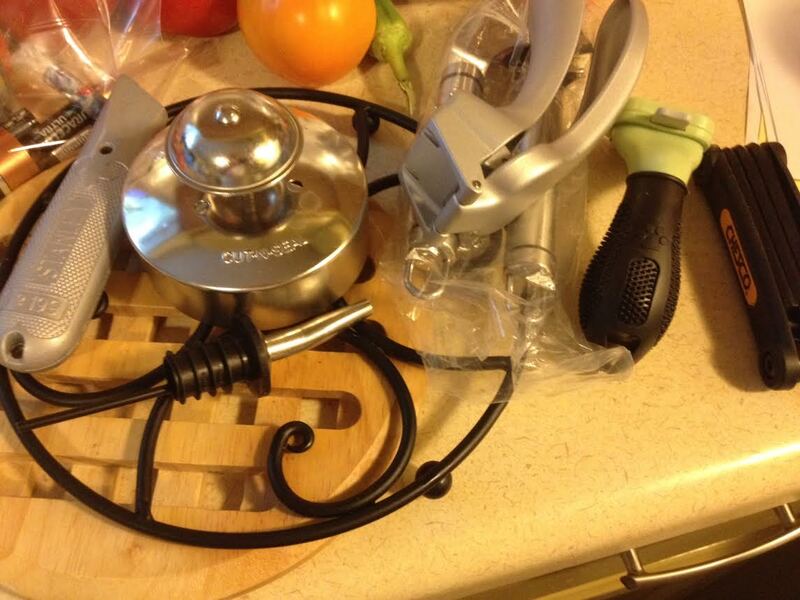 I got rid of receipts and old warranties – things like this pile up and you know it! An even better idea to get rid of these would be to scan them into electronic files and put them on your USB drive. Then you can throw the hard copies away and don’t have to worry about keeping up with those ever. But for now, I’m okay with these results. Yeah, the kitchen drawer is a tiny part of my life, but for now, and hopefully for a bit longer, I won’t have to think about it anymore. 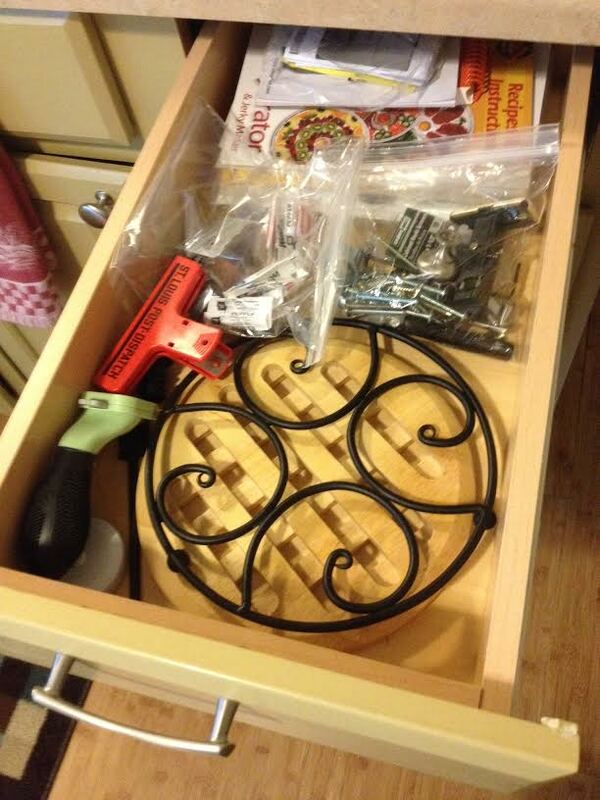 The finished result…Junk drawer no more! Tomorrow I’ll be facing another not-so physical space. This will be a quick fix for me personally, but for some of you out there, Day 3 could take a very very long time! ! !